Immediately, the reader is thrust into the world of the narrator, that of a woman unhappy with where life has brought her and who feels trapped by the family she has somehow acquired. A foreigner in a small community, she already stands out, and her behaviour can only exacerbate this sense of not fitting in. Any remaining doubts she has about her future are easily removed by the presence of her mother-in-law, an elderly woman with nothing to live for after the death of her husband. The young woman realises that the old lady is a picture of her own future. One way of coping is to turn her energy outwards, often in the form of violence. Her temper is short, and her tendency to torture insects is just a precursor to greater outbursts of anger, with major consequences for a family pet. However, with her attention wandering most of the time, she also ends up in the wars herself, acquiring cuts and burns all over. It’s as if the house simply isn’t a suitable habitat for her (little wonder she wants to spend so much time outside). 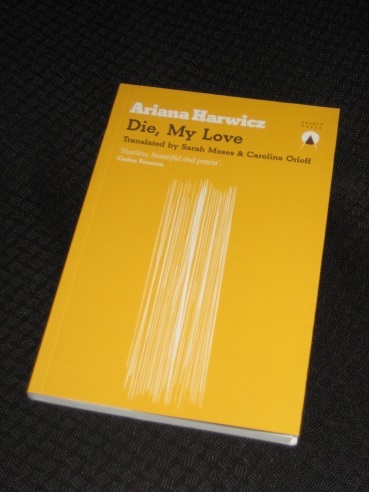 Die, My Love is one of the shortest books on the MBIP longlist, yet it’s not really as quick a read as you might expect. The novel is divided into many short sections, usually two to three pages long, and the slightly unnerving tone is produced by a series of short, simple sentences,with little linking at times. Along with a complete lack of names (of people or places), this creates a claustrophobic air to the book and unsettles the reader. In this, there are hints of one of last year’s big contenders, fellow Argentine writer Samanta Schweblin’s Fever Dream, albeit it at a more ponderous pace. Another short work it reminded me of, though, was a previous IFFP longlisted title, Véronique Olmi’s Beside the Sea. Like Olmi’s novel, Die, My Love uses a first-person point of view to immerse us in the life of a troubled woman, leaving the reader to guess at (or diagnose…) possible mental illness, or severe post-natal depression. These short sections, almost like diary entries, are entirely one-sided, meaning we have little opportunity to see the other side of the story; only on a few occasions do we get hints of how the other characters might see her. This will probably be close to making my final six. There’s a lot to like about Harwicz’s short work (and with several longer books on the longlist this year, I was very grateful for its brevity!). The strongest aspect of the novel is the way the writer builds up the atmosphere, keeping the reader as woolly-headed as the narrator. Overall, it’s an impressive work and a great introduction (for me) to a new press – which is always a good thing. I found it a very agitating read, not good for my blood pressure. So, as you say, a second, calmer reading might allow me to make more of its style. Still haven’t read Fever Dream though, and I hear so many comparisons to it. I always find out about books I’ve never heard of at your blog, and this sounds like my cup of tea: I love South American novels, even when they’re set in France (probably)! Thank you Tony for your great review. I have the book not yet read. One thing, I have read several reviews, what stands out, it leaves no one unmoved, I suppose a good thing in order to make the short list.